For a time the wine consumed in Florence came almost exclusively from the Chianti zone, in particular from the areas of Poggibonsi and Rufina. Of the two towns though, it was Rufina that had a rather particular way to celebrate the annual wine harvest known as the 'vendemmia'. The new wine that came from this land, with its robust, ruby-red color, was actually transported into the city atop a structure known as the 'Carro Matto' literally translated as Crazy Cart. 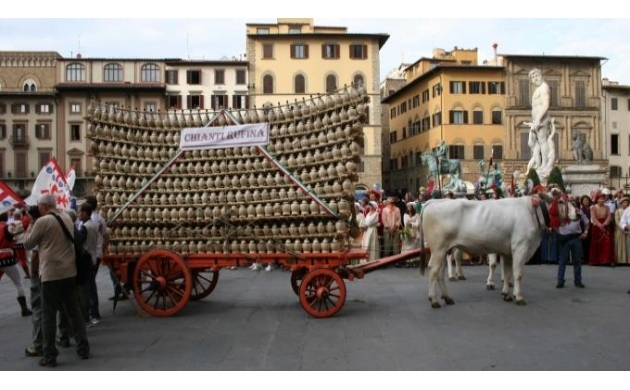 This 'Carro Matto' was actually a cart pulled by oxen, atop which were loaded 'fiaschi' (the traditional Tuscan wine bottles) one on top of the other to form a giant pyramid. With the formation of the Florentine Republic, this tradition was preserved and formalized. 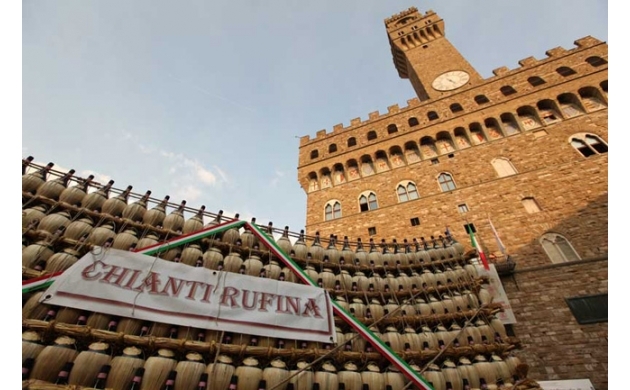 A cart with over two thousand bottles of wine would arrive in the city during the fourth week of September, stopping for a blessing at the church of San Carlo (in via dei Calzaiuoli), before continuing on the Palazzo Vecchio. Here the authorities of the time would make a toast to the health of the Florentine people, blessed by the arrival of this new wine. The 'Bacco Artigianato' is the re-creation and celebration of this folk tradition that has remained unchanged throughout the centuries. In fact, the 41st edition of the Bacco Artigianato will be held from the 22nd to the 25th of September 2016. It's worth the effort to watch the festivities on Saturday the 24th of September, when the historical parade of the Florentine Republic meets the 'Carro Matto' in the Piazza Duomo. Here the cart will receive its blessing and wine will be offered to the religious authorities. The parade then moves on to Piazza Della Signoria, where the historical flag-throwers put on a demonstration in front of a large audience before more wine is offered to the civic authorities. For those able to move around outside of Florence it is also possible to participate in the trade show of the Chianti Rufina DOCG and Pomino DOC wines in Rufina - a beautiful hilly area located in the countryside of the province of Florence. Among the wines produced, one of the best is the Chianti del Putto. Inside this trade show you can taste the wines produced in the region (Chianti Rufina and Pomino) and sample the typical local cooking that combines perfectly with these wines. Among the stands are also local craftsmen with their artisanal wares. To go along with the 'Bacco Artigianato' and the celebration of this wine , and obviously the traditional 'Carro Matto' with its numerous 'fiaschi' all arranged with precision down to the millimeter in order to compose a real and true monument to wine and its world.